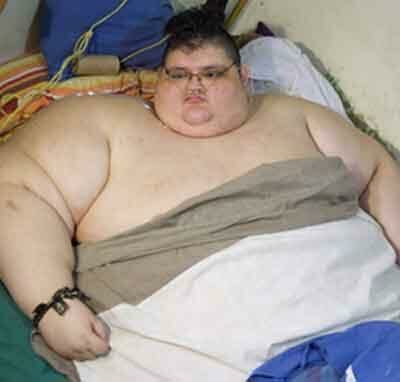 Mexico : The world’s most obese man in Mexico began medical treatment to lose weight. Juan Pedro Franco, 32, weighing 500 kg, was transported night by a specially-adapted van from his hometown of Aguascalientes in central Mexico, to a private clinic in the city of Guadalajara in western Mexico, Efe news reported. “Juan Pedro arrived at the Jardines de Guadalupe de Zapopan Hospital after a complex transfer,” Gastric Bypass Mexico, the medical centre handling the case, said in a communique. The 32-year-old Pedro on Wednesday said that this is “the start of a new life”, adding that he was “grateful and hopeful” for the opportunity being provided to him. He said that with his current situation he knew that he was in danger of dying, saying that he had been overweight ever since he was a child. “At 15 I already weighed about 200 kg and my body continued gaining weight out of control. I come from a humble family and we didn’t know how to fight against my obesity,” he said. Doctor Jose Antonio Castaneda, who together with his team has handled more than 8,000 cases and will treat Pedro through the health centre’s social action program, visited his new patient before the transfer. Pedro’s medical situation includes several ailments associated with obesity, including hypothyroidism, Type 2 diabetes causing hypertension, a high blood glucose level and chronic obstructive pulmonary disease, the statement said. During the transfer to Guadalajara, the patient was accompanied at all times by Castaneda and several members of his team, as well as by a medical unit that monitored his health status and could treat him if it had been needed. The treatment will last about six months, during which he will lose weight and have his other ailments addressed, and it will culminate in surgery to “definitively resolve his problems of obesity and reduce his weight”. According to a 2015 study by the Organisation for Economic Cooperation and Development, about 32.4 per cent of adult Mexicans are obese, a figure exceeded only by the US, where 35.3 per cent of adults are obese.